After an extended national search lasting more than a year, the James M. Hull College of Business at Augusta University has found a new dean. Dr. Richard M. Franza, currently senior associate dean of the Michael J. Coles College of Business at Kennesaw State University, has accepted the position and will officially join the university on Feb. 1, 2017, succeeding Dr. Mark Thompson, who has served as interim dean since the departure of Dr. Marc Miller in July 2015. 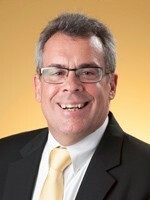 Franza, who earned his doctorate in operations management from the Georgia Institute of Technology, his Master of Business Administration from Duke and his Bachelor of Science in Applied Mathematics from Notre Dame, has been with Kennesaw State since 2002. All deans are critical to a university’s success, and Caughman says finding the right person to lead a college of business is especially important because of the relationship of the college, and its dean, to the local business community. In Augusta, that importance is heightened because of the university’s growing cyber program, academically housed in Hull, and the expanding affiliation with the military. That relationship with the military dovetails nicely with Franza’s experience outside academia. While serving in the United States Air Force as a strategic defense initiative project manager, Franza directed the research and concept development efforts for the “Star Wars” program in the mid- to late 1980s. “He has a real appreciation for what our military is and does, and I think that will be to our advantage as we continue to grow our relationship with Fort Gordon and the Cyber Center of Excellence as well as the NSA,” Caughman said. While expressing excitement for the future, Caughman was also quick to praise Thompson’s interim guidance.